Going Glass!? does this all fit together? I am looking at a 7.5-10 gallon aquarium for a very specific area in my office (long countertop, in the corner). I looked at were in fact like the Spec V... but I really dislike the filtration (I have the spec III and cant stand it) and the lighting is obsolete as it has a 'white/blue' color (I prefer my ONF nano lighting). Question: Since this new tank will be fry heavy, I would like to have a sponge filter but it will be a planted tank- is there a way to make it more design oriented? so it really looks classy? Being a designer, I cant stand bunches of chords, equipment, etc. I'd suggest a small Aquaclear HOB with a pre-filter. I can however go through the counter if needed (where the chair is as the electical plug is down there anyways). So I could do a canister filter bolted to the wall under the counter and run the tubes up through the counter. Im not accustomed to futzing with filters, I usually buy them, build aqwauriums, and care for fish. Not this detailed stuff. So who do I tank to to figure out setting up JARDLI Plant Aquarium Glass Poppy Pipe Outflow and Lily Pipe Inflow, etc type thing? with a canister? how do I know what size? 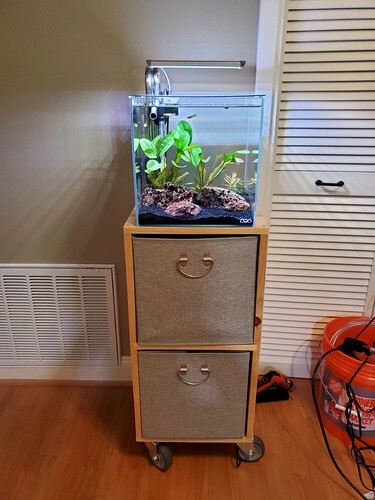 Im looking at the Penn Plax Curved Corner Glass Aquarium Kit (but toss the light, and the filter) but the 10 gallon seems perfect? You also could plant it heavy. Low fish load. Do water changes. No filter required. 1) Filter for a 10 gallon with a lot of stones? Am I doing this right? I know there was discussion of tube width, etc... Amazon 'recommended' these together as a purchase. I have not decided between the two tanks.... but one is less money, but similar times. Then I need to figure out lighting. Some people said that the canister filter 10 of the zoo med can not be placed below??? is that true? Some people said that the canister filter of the zoo med can not be placed below??? is that true? Maybe look at the OASE Indoor Aquatics Filtosmart 60? For lighting I like the Fluval Plant 3.0 LED Nano or Finnex Planted+ Nano depending on how much light you need or if you want the bluetooth. When in doubt, I go cheap and that often means DIY as I can use so many things and throw them out at low cost if it turns out wrong. So my suggestion? If you like sponge filters but not the "look", how about a sponge but hidden with a cover. Water doesn't have to flow through in any special direction so a plastic like possibly a milkjug, cut down to a shape that fits and then super glue a bunch of plants and/or substrate on, to hide the cover. Recommend keeping the plants to things like Java fern on the cover, so that it can be lifted totally out to access the sponge. Not viney things that tend to grow out and attach to the rest of the tank and have to be cut to remove. Sand/gravel can be stuck into fresh silicone to make a "portable" hillside. Will it be strong enough to go up 11 inches? If you like sponge filters but not the "look", how about a sponge but hidden with a cover. I remember ADA prep 6 years ago.... someone said to me 'you tie all your moss!? why not use superglue!?' I was dumbfounded... I couldnt believe it. Hmmm..... possibility for modification is a good idea. After all its not like I do anything normal to date, ha! OASE says it's for up to 20 gallons. I have the AZOO External Power Filter running a 7.5 gallon cube and it sits at about 40" below the water surface on the tank. The flow is reduced but it's still more than plenty of that tank size. The AZOO, Zoo Med, Finnex and OASE are all extremely similar. All that being said, I actually don't like these smaller canister filters. They are a pain to prime when you clean them. That's why I thought the OASE looked nice with it's "self priming", though I don't know how well it works. You could also save some money and skip the glassware for a while. Gives you something to upgrade later. Right after I rescaped it. I will also throw in that I hate the smallest canisters as they have no way to disconnect the tubing when cleaning the filter and that means pulling the in and out completely out of the tank and on the Zoomed 501, I hate the latching system. Just doesn't fit my fingers or something and I now have two "closet queens"to store. I got into them in trading around but when I look at the prices, it really does make the somewhat larger like Sunsun/Aquatop, etc. fit my plans better. The Zoomed 501 does need to be close to the tank level. I will also throw in that I hate the smallest canisters as they have no way to disconnect the tubing when cleaning the filter and that means pulling the in and out completely out of the tank and on the Zoomed 501, I hate the latching system. This is very true. I had some of the Eheim quick disconnects that I could use which made it a lot easier. When it comes to simplicity, I think HOB is your best option. Low cost, out of the tank, easy maintenance. Whenever I've tried to make a sponge filter look good in a tank by hiding it, it's always become a pain to clean. I also find most small air pumps to be quite a bit noisier than an Aquaclear 20.